Michigan Public Radio has been running a really good series on the state of our schools. They’ve talked about declining funding and the increase in charter schools, but haven’t quite gotten to the point of asking how this all happened. That’s going to be up to activists. Progress Michigan is taking that on. A lot of it goes to one family, DeVos, of Grand Rapids. They’ve contributed to Republicans and spread the myth of failing public schools and the supposed benefits of charters. This is going to be important. The Michigan Legislature never ceases to amaze. Making it hard to vote is not enough. Now they want to reduce the information available to voters. It has long been illegal for municipalities to advocate for or against ballot initiatives. But cities and school districts have been able to publish objective information about initiatives. Under this legislation that would be illegal for 60 days prior to an election. What does that mean? Information will come from those with an interest in the outcome, such as, oh, let me see, maybe Americans for Prosperity? Sure, liberal and progressive groups would also be able to publish information, but we generally have less money than the Koch funded astroturf organizations. This is an example of fixing a non-existent problem. Kind of like eliminating straight party voting. Tennessee GOP politicians may have overstated their case. While Sen Corker claimed he had information that a non-union Chattanooga VW plant would increase its chance of getting a new SUV to build, it seems his information might be suspect. You see, decisions about new products come from a joint union-management board. The union members of the board do not want new products going into a non-union plant. The works council model is such an integral part of the VW culture, the Chattanooga plant is suddenly an outlier. Maybe they should take up Mayor Bernero’s offer to come to Lansing. A remarkable story is unfolding in Chattanooga, TN, at the Volkswagen plant. VW is not opposing the UAW organizing drive. The company has a good working relationship with unions at its German plants, which includes Works Councils, joint union-management councils that resolve problems before they become problems. VW can’t promote the union because we have laws in this country against company unions, that is, unions that are dominated by management. But they can choose not to oppose the union drive. So we would expect that the pro-business Republicans in Tennessee would stay out of the election. After all, pro-business should mean that corporations can run their business as they see fit. But no. Tennessee Republicans are not pro-business so much as they are anti-union. Even if the business sees an advantage in having a union, the state thinks it should be able to threaten VW with loss of incentives if they organize. Now I understand that VW doesn’t have a right to incentives and Tennessee may withhold incentives for any reason or no reason at all. But clearly giving business the freedom to operate as it wishes stops when they cross the GOP’s anti-union line. Of course they point to Detroit, saying look what the unions did to Detroit. It’s now bankrupt. It’s a common GOP misunderstanding, to conflate the auto companies with city government. Mitt did it, too. The Free Press had an excellent story about the roots of the city’s financial problems. It has more to do with Wall Street than the UAW. There’s another curious twist to the story — Tennessee Republicans fear some sort of domino effect. They fear that one union plant in Tennessee will mean other German plants in the South will fall to the union. I guess the union must have mysterious powers to jump from one plant to another. Update: John Nichols at The Nation has an excellent explanation of the Works Council concept and UAW’s adaptability. 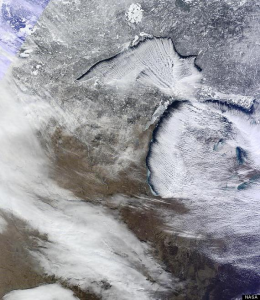 Huffington Post had this great satellite photo from today, showing both peninsulas of Michigan and surrounding states and provinces. An arctic cold front crossed the lakes, which are visible on the north and west shores as dark lines. The moisture from the lakes forms clouds which then deposit snow when the northwest winds bring the clouds over land. 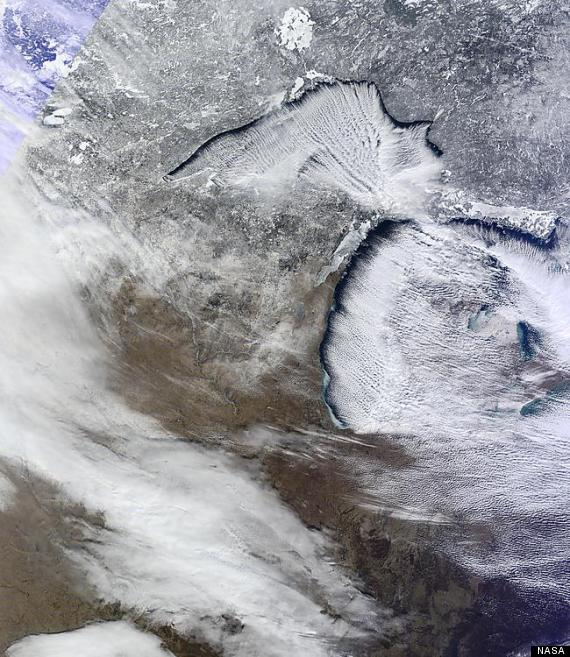 The dense snow along the lake shores is clearly visible.